Note the long snout and the wild-boar-tusks on the proboscis (left one sticking up, right one somewhat flattened). 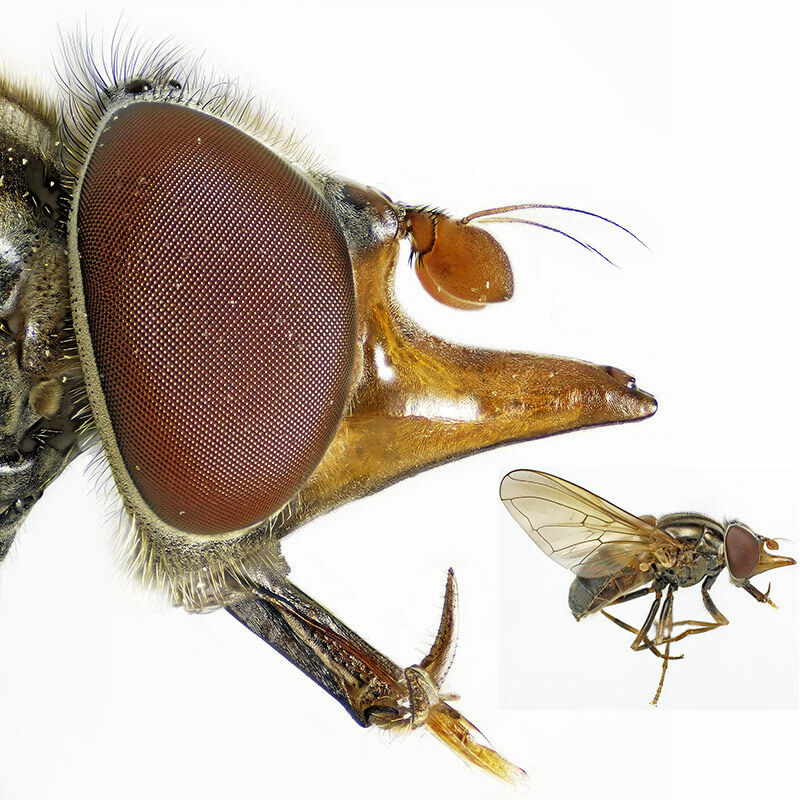 Diptera: Syrphidae: Rhingia nasica. The only member of the genus in North America. Length 8.5mm. Bizarre creature, very nicely photographed. How does it use these strange mouthparts? Weird! We have a couple of Rhingia species in the UK, campestris and rostrata. Both have the snout but neither have the tusks as far as I know. I shot one of this genus and found I needed a /lot/ of diffusion on the flashes to avoid the flare on the snout, it's obviously very reflective..
Edited to add: After posting that I wondered whether I'd posted my Rhingia here, and I did, it's here and look, having said I don't think they have the tusks, there they are! Not as obvious in my shot though.. According to Steve Marshall "Insects Their Natural History and Diversity" (the best book for species identification for insects of eastern North America) the proboscis is housed in the snout; its drops down at right angles when the fly feeds. So my guess is that the wild-boar-tusks are for parking/guiding the proboscis in the snout. Need to see a photo with the proboscis 'parked'. Got to add that to my "need to get a copy of" list. Thanks! Great images by the way. Wow interesting fly,and to think most people would just swat it without a thought. But insects are fascinating when seen up close.